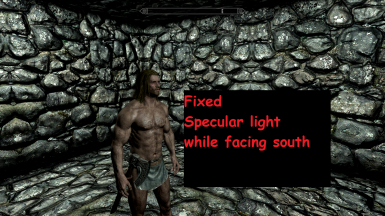 Fixes the bug where all character lighting other than diffuse breaks unless you are facing due north in game. Due to a bug in the game's character lighting shaders, all lighting other than Diffuse was broken unless your character was pointing straight north, and even then it wasn't necessarily working correctly. This mod is a patched shader file that patches all 378 of the affected shaders, fixing one of the nastiest bugs in SSE. I decided to make it a separate mod due to the severity of the bug and the fact that it doesn't involve the SKSE DLL part at all, its purely a shader patch. Install like any other mod. It just replaces the file that's inside the Shaders bsa, so a loose file will override it. 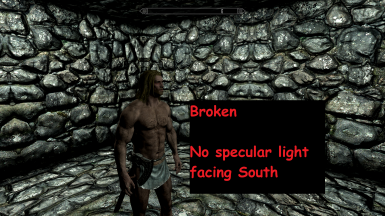 SE ENB version 0.370 and up includes this fix and it will conflict; you do not need the mod if you use ENB. MO will show like this for now. It will work. 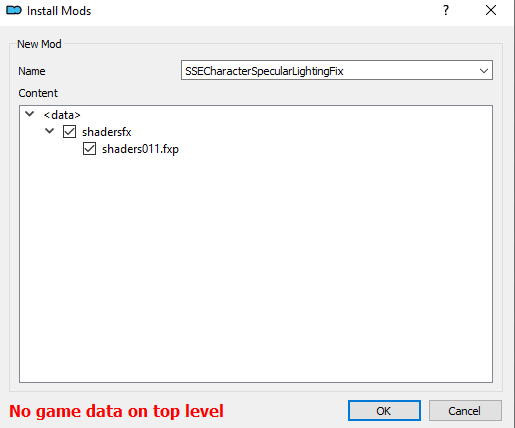 The shadersfx folder doesnt count as data in MO yet. This will be fixed next time MO has a release. my cold - made me crazy enough to think "what if"